Decorate your wine bottles! Here I have used labels that I printed using clip art of a skull and crossbones that’s a lot less expensive than buying pre-made labels. 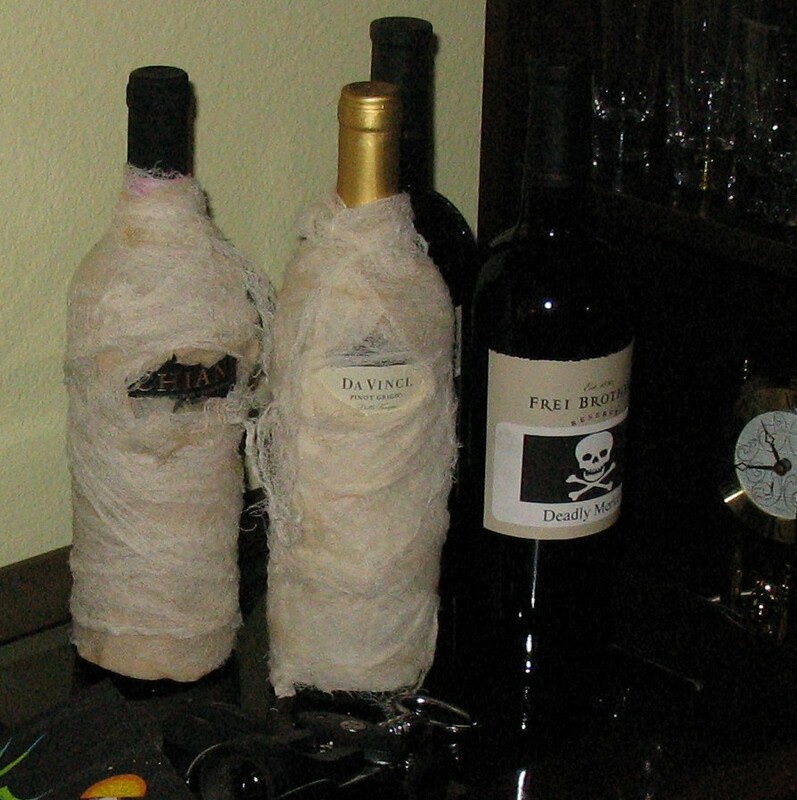 Also pictured, are two wine bottles are wrapped like mummies. I used cheesecloth that I soaked in tea, to give it an aged look. I found the inspiration and the “how-to” for these at http://www.marthastewart.com/264244/mummy-spirits. You could glue on little “googly eyes” peeking out from the opening in the wrapping for a little added fun. You can find those at a craft store. Add these uninvited little guests (wired to the light fixture) above your food/appetizer table! No party leftovers! On the dining room wall, above the “buffet” cabinet, are a bunch of bats (a flock?, a herd? a gaggle?) – what ever you call them, they are flying this way. 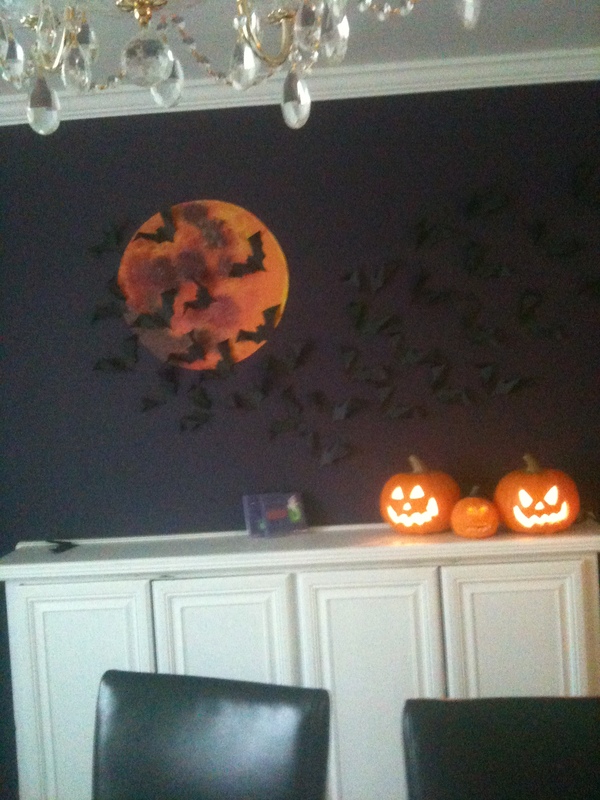 In this case the bats are made from construction paper, folded at the wings joints to give it a 3-D look on the wall. The bats are stapled to the wall (I used a swipe of black magic marker on the staples to eliminate reflection off the staple). This was inspired by a project in Better Homes & Gardens magazine, Halloween edition. (Could not find an online photo of theirs). For my project, I added a full moon in the background. I cut out a big circle on yellow poster board and painted it like a “blood” moon. 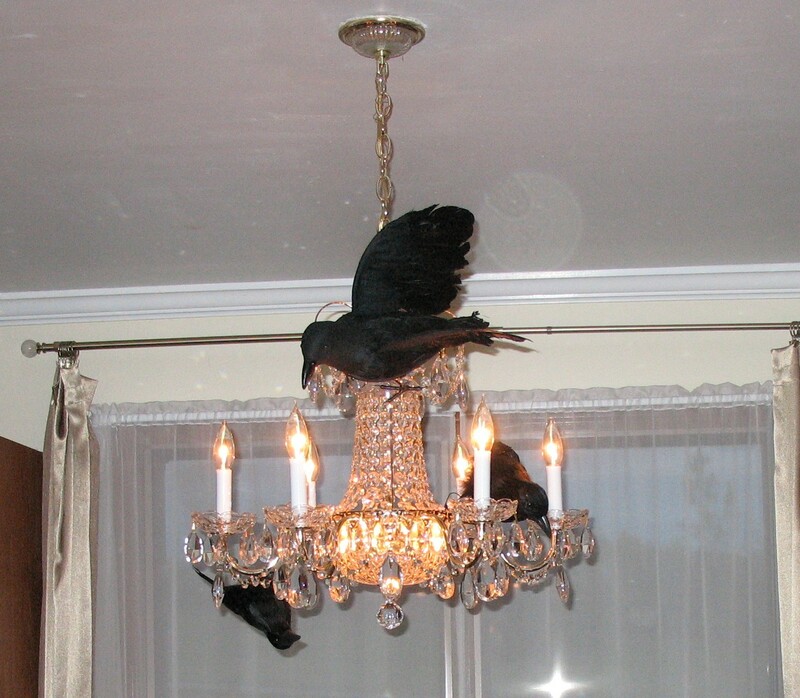 This was the centerpiece for my dining table at a Halloween dinner party a few years ago. 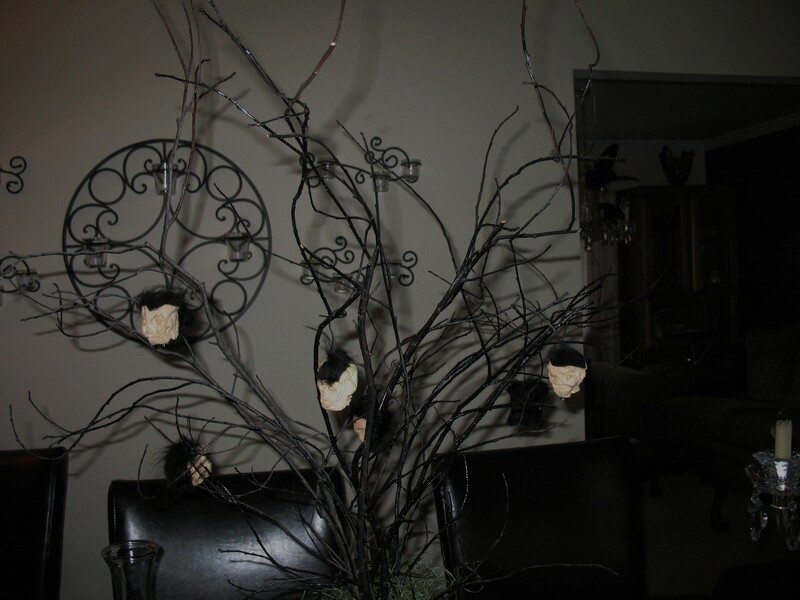 The “tree” is a bunch of branches from my yard, spray-painted black. The “shrunken heads” are made from dried apples that have a little faux fur glued to the top to simulate hair. The inspiration for these came from here: http://www.marthastewart.com/268080/shrunken-apple-heads Normally the drying process can take up to 2 weeks, but you could probably speed that along with a dehydrator or your oven. 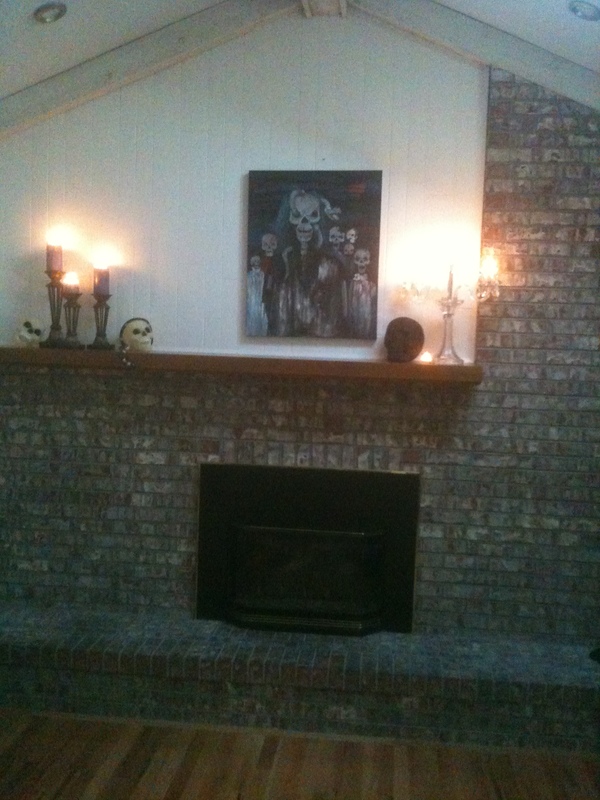 Instead of just adding Halloween stuff to your room, try temporarily replacing the normal stuff with the creepy stuff. In this case I have used a painting, painted by my mother (an artist in Phoenix). It is given the prominent spot above the fireplace temporarily replacing the wall clock I usually have in that spot. If you are not artist or have a friend who can paint something “Halloween-ish” for you, you could alway use a grouping of photos (either your own or some free stock photos online). Maybe something like black and white photos of gnarly trees or Victorian head silhouettes. Okay- so this one broke the “cheap & easy” rule this year. But it was fun! 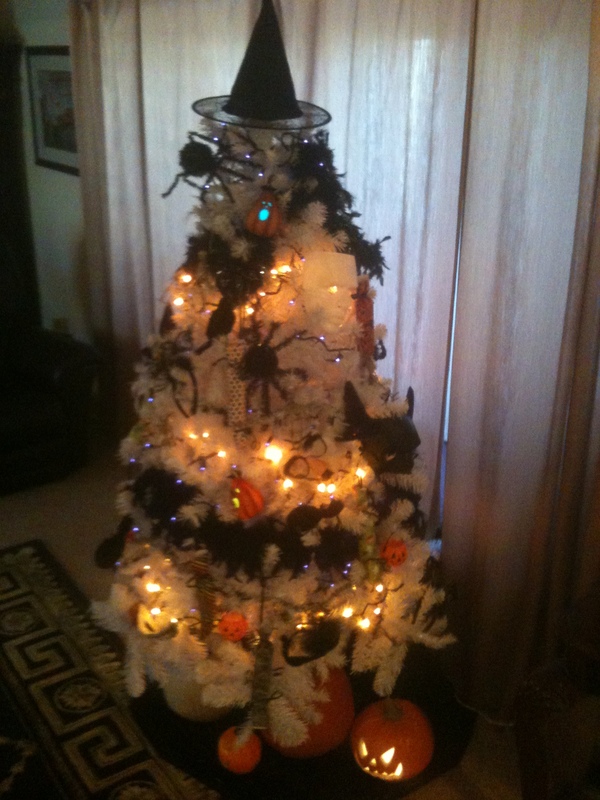 This is my Halloween tree, reminiscent of the costumes and the trick or treating of my childhood. The tree is topped with a witch’s hat. There are pumpkins and Jack-o-Lanterns under the tree. Feather boas act as a garland. Masks, novelty head dresses, black birds, spiders, & miniature plastic pumpkins filled with candy corn act as ornaments. There are strings of purple and “candy corn” lights to make the tree glow. I also made colorful “crackers” filled with wrapped miniature candy bars. Not only do they add a little color to the tree, they can also act as party favors for guests. Variations on the theme might include using a Halloween village or train set under the tree… maybe next year. Here are a couple of my favorite places to find inspiration for Halloween decor. But I think it is always more fun to put your own spin on the projects inspired by others. This entry was posted in Miscellaneous & Funs Things!, Uncategorized and tagged decorations, Halloween, indoor on October 17, 2012 by joanbagwell. Since I am currently deep in my writing cave, I thought I’d share with you these amazing Halloween decorating tips and pictures.